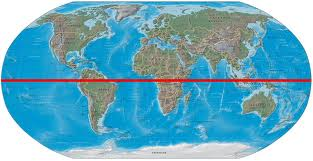 Living close to equator with higher asthma risk? ARLINGTON HEIGHTS, Ill. (February 4, 2013) – Those living near the equator may find themselves sneezing and wheezing more than usual. And the reason may not be due to increasing pollen counts. According to a new study released today, in the February issue of Annals of Allergy, Asthma & Immunology, the scientific journal of the American College of Allergy, Asthma and Immunology (ACAAI), living in locations closest to the equator can put you at increased risk of developing allergy and asthma. Comments Off on Living close to equator with higher asthma risk? The most important medication to treat asthma is inhaled corticosteroids. Inhaled steroids reduce airway inflammation in asthma and reduce asthma exacerbations. It is the first line therapy for persistent asthma. It has been known that inhaled steroids can reduce adult attained height and the study published in NEJM suggests that height reduction is 1.2 cm in the inhaled steroid group compared to placebo. This is actually very encouraging data, given the effectiveness of inhaled steroids in controlling asthma and that the loss of height is only 1.2 cm should encourage physicians and parents on the safety of inhaled steroids. Remember that uncontrolled asthma will also lead to worsened growth compared to children with controlled asthma on inhaled steroids. Asthma exacerbations can lead to even more potent systemic steroids that have to be used as rescue therapy. CHICAGO (Reuters) – Adults who took inhaled steroids as children to control their asthma may be shorter than they otherwise would have been, but only by a little, U.S. researchers said on Monday. Results of a long-term asthma study found that children who used an inhaled steroid before they entered puberty were about a half-inch shorter as adults than those who did not take the drugs. Doctors have known since the 1990s that inhaled steroids taken for asthma can delay growth, but researchers had believed these children would eventually catch up. “This is mostly good news,” said Dr. Gail Weinmann of National Heart, Lung, and Blood Institute, a part of the National Institutes of Health, which supported the study. Weinmann said the drug has been proven over and over to be the most effective for the most people, but there had been this lingering question about its effect on height. “Now we know what it is. It is a half an inch,” she said in a telephone interview. The study, led by William Kelly of the University of New Mexico Health Sciences Center, is the first to follow inhaled steroid users until they reached their adult height. Kelly and colleagues studied more than 1,000 children aged 5 to 12 who were treated for mild to moderate asthma as part of a comprehensive asthma study. The researchers divided the children into three groups: one got twice-daily treatment with AstraZeneca’s Pulmicort, known generically as budesonide, an inhaled corticosteroid medication; a second group got nedocromil, an older inhaled non-steroid medication; and a third got a placebo. The team followed nearly 950 of the children until they reached adult height. They found adults who took the inhaled steroids were slightly shorter than either of the two other groups. Those most affected had started on steroids before they reached puberty, and the height effect varied depending on dose, with those taking higher daily doses experiencing the biggest effect on height. “This suggests that finding the minimum dose required to control each child’s asthma could help mitigate any potential effects on height,” Kelly said in a statement. The findings will be presented on Monday at the European Respiratory Society meeting in Vienna, and published online in the New England Journal of Medicine. Where there isn’t drought, high humidity and rain are hiking up mold counts (and sneezes) in some parts of the country. But many people think mold only grows between bathroom tiles. On Monday, Leija recorded a mold count above 125,000 per cubic meter of air — the highest count he’s seen in his tenure. For comparison, a mold count of just 50,000 per cubic meter of air gets an air quality warning. More than a month of 80-plus degree temperatures, high humidity, and a weekend of thunderstorms likely triggered the spike, he says. Tuesday’s count dropped to a less extreme but still higher-than-normal 60,000. 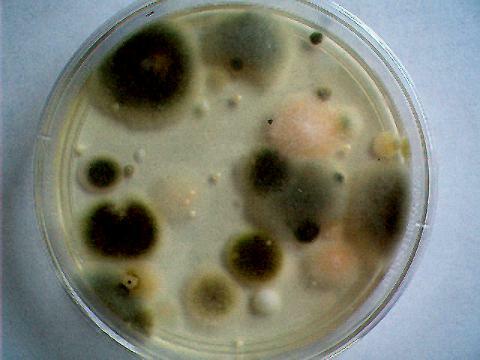 Molds are microscopic fungi that produce spores, which spread through the air. Mold is a year-round problem for allergy sufferers, because it grows both outdoors and indoors. Mold can collect in cool, damp places (like basements and bathrooms) any time of the year. Outside, humid weather can cause high mold concentrations, especially during summer. High mold counts mean standard allergy symptoms — such as congestion, sneezing, a runny nose, and watering, itchy eyes — for people sensitive to it. And unlike pollen, which you can see piled up on your car windshield, and dust mites, which you can see everywhere, you might not notice that mold spores floating through the air. If you test positive for mold allergies, Leija says making sure the air you breathe is clean is the most important thing you can do. He suggests pumping up the air conditioner in the car and in the house, and using dehumidifiers inside to prevent mold from growing. Asthma is a chronic inflammatory disorder of the airways. The chronic inflammation is associated with airway hyper-responsiveness that leads to recurrent episodes of wheezing, breathlessness, chest tightness and coughing, particularly at night or early in the morning. These episodes are usually associated with widespread, but variable, airflow obstruction within the lung that is often reversible either spontaneously or with treatment. How can asthma affect a person’s lifestyle? Asthma can limit a person’s activity because of shortness of breath and wheezing. Uncontrolled asthmatics can be living in constant fear of their asthmatic attacks and thus are afraid of leaving their homes or pursuing physical activities. The goal of asthma control is to minimize symptoms with medications so that the patient can lead a normal life. Can coughing or wheezing be early signs of asthma? Wheezing is the primary symptom of asthma accompanied by airway hyper reactivity that is reversible with bronchodilators. Chronic cough as defined by lasting more than 8 weeks can be an indicator for asthma. Asthma in children can present as coughing after activities such as running or as night time cough. Do asthma medications become less effective if taken for a long time? Contrary to popular belief, proper use of asthma medications can reduce airway inflammation and lead to decrease medication use. On the other hand, inadequately controlled airway inflammation will lead to exacerbations of asthma and the need for more potent medications for rescue therapy. The aim for asthma management is to achieve the best possible lung function using the least amount of medications neccessary. Successful asthma management involves keeping asthma under control and preventing asthma attacks. Allergic asthma is one of the main causes for asthma and causes inflammation of the airways that leads to shortness of breath, chest tightness and wheezing upon exposure to the allergen. 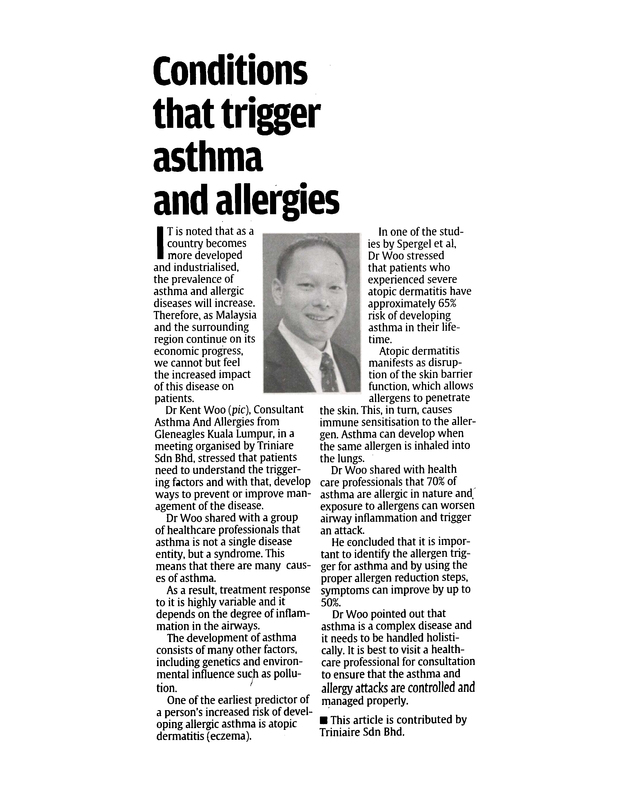 It is sometimes hard to differentiate allergic asthma from other causes of asthma without proper evaluation by an Allergist. Sometimes defects in the immune system particularly antibody deficiencies can present similar to asthma with respiratory infections that can lead to shortness of breath, wheezing and decreased lung function. Requiring prolonged or multiple course of antibiotics for treatment. If you suspect immune dysfunction an Allergy/Immunology specialist can conduct proper evaluation. 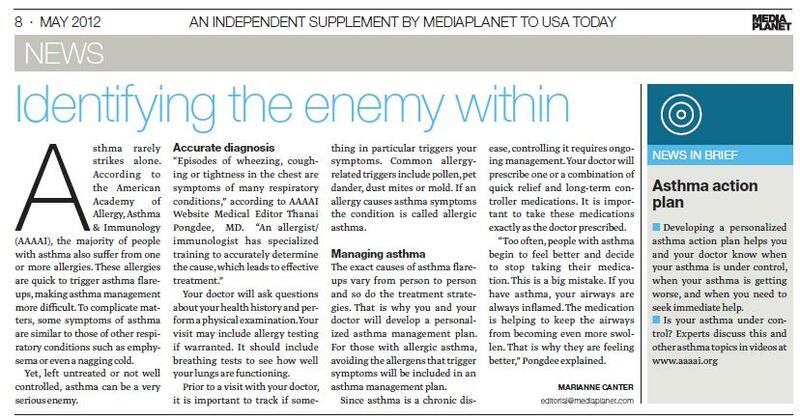 Below is an article in Bahasa Malaysia that talks about asthma as well as primary immunodeficiency (PI). TANGGAPAN bahawa perkembangan penyakit berkaitan alahan dan imunologi seperti Primary Immunodeficiencis (PI) sebagai kes terpinggir dan jarang dihidapi seharusnya dikikis bukan saja di kalangan masyarakat malah pihak berkuasa. Kebanyakan kes diagnosa PI adalah di kalangan kanak-kanak berusia kurang dari setahun. Bagaimanapun, bentuk PI yang kurang serius tidak dapat dikesan sehinggalah penghidap lebih dewasa. Dalam satu kajian beberapa tahun lalu, kadar tersebar luas penyakit ini dianggarkan 1 dalam 1,200 orang. Malah, laporan kajian yang dikendalikan Malaysian Primary Immunodeficiency Network atau MyPin mendapati daripada sejumlah kanak-kanak yang berkemungkinan menghidap PI, 30 peratus daripada mereka disahkan menghidap penyakit ini. – Dr Amir Hamzah Abdul Latiff, Presiden Persatuan Alahan dan Imunologi Malaysia (MSAI). Presiden Persatuan Alahan dan Imunologi Malaysia (MSAI), Dr Amir Hamzah Abdul Latiff, berkata PI bersifat warisan selain berpunca daripada kecacatan genetik dalam sistem imun. “Ini menyebabkan penghidap mudah mendapat pelbagai jenis jangkitan yang menjejaskan kulit, telinga, paru-paru, usus dan organ lain tubuh,” katanya kepada Sihat. Dr Amir Hamzah berkata, jangkitan yang dialami pula bersifat kronik, berterusan, berulang dan dalam sesetengah kes membawa maut. “Dalam satu kajian beberapa tahun lalu, kadar tersebar luas penyakit ini dianggarkan 1 dalam 1,200 orang. Malah, laporan kajian yang dikendalikan Malaysian Primary Immunodeficiency Network atau MyPin mendapati daripada sejumlah kanak-kanak yang berkemungkinan menghidap PI, 30 peratus daripada mereka disahkan menghidap penyakit ini,” katanya kepada Sihat. Dr Amir Hamzah berkata, sehingga kini Malaysia hanya mampu mengesan dua peratus saja daripada penghidap PI dan ini bermakna, ramai ibu bapa yang tidak tahu anak mereka menderita penyakit ini. Beliau berkata, peningkatan jumlah kes menunjukkan PI bukan penyakit luar biasa di mana pakar klinikal dan perkhidmatan diagnostik perlu dibentuk dan digerakkan segera bagi mengawal dan menguruskan penghidap PI ke paras optimum. Berikutan usaha berterusan MyPin menyuarakan kebimbangan mengenai penularan penyakit ini dilihat gagal meraih perhatian pihak berkaitan, Minggu PI Sedunia dianjurkan di Kuala Lumpur mulai 22 April lalu dan dijangka berakhir, hari ini. Program ini antara lain menyeru pengamal perubatan untuk menyedarkan masyarakat mengenai bahaya PI serta membantu mereka menjalankan diagnosa bagi membolehkan rawatan cepat, tepat dan berkesan diberi. Kesedaran klinikal dan prosedur diagnosa yang lebih baik selain menyedarkan umum mengenai penyakit ini sangat penting kerana PI boleh disembuhkan. Sementara itu, Perunding Alahan Pediatrik dan Dewasa di Hospital Gleneagles, Dr Kent Woo Chee Keen berkata, ramai orang menyangka mereka mempunyai penyakit alahan terutama membabitkan saluran udara, tetapi sebenarnya masalah imun. “Dua perkara penting yang perlu saya tegaskan ialah sesiapa yang mendapat serangan resdung atau sinus dua kali atau lebih dalam masa setahun yang memerlukan dua atau lebih jenis antibiotik setahun, ia adalah satu tanda amaran bahawa anda menghadapi masalah kecacatan imun atau PI. “Satu lagi amaran jelas adalah apabila anda sering berulang alik ke hospital sekitar empat kali atau lebih setahun, memerlukan antibiotik dan mengalami radang paru-paru, anda berkemungkinan mengalami PI,” katanya. Dr Kent berkata, sama juga dengan persepsi terhadap asma atau semput. Ramai yang menyangka ia adalah penyakit padahal asma adalah gejala kepada penyakit alahan. Sehubungan itu, amat penting bagi individu yang mengalami asma menjalani ujian dan penilaian sempurna. Mereka perlu berjumpa pakar imunologi dan pakar alahan supaya dapat mengesan faktor penyebab kepada alahan itu. Oleh itu, pesakit dapat mengelak daripada terdedah kepada faktor berkenaan seperti alah kepada anjing, kucing atau habuk. Gunakan kaedah paling berkesan dan praktikal seperti tidak membela haiwan peliharaan atau menjemur, mencuci cadar, bantal dan tilam sekerap mungkin. Nafas berdehit dan batuk berterusan adalah tanda awal asma tetapi bagi seorang dewasa yang batuk selama lapan minggu secara berterusan (batuk kronik), ia adalah tanda mereka menghidap asma. Ini juga menunjukkan bahawa ramai orang yang mengalami asma tidak tahu mereka menghidap penyakit itu. Asma datang dalam pelbagai bentuk termasuk asma yang berpunca daripada alahan, tanpa alahan dan cara kerja. Dengan penilaian dan diagnosa yang tepat asma boleh diurus dan dirawat. Antara rawatan paling berkesan adalah dalam bentuk sedutan kortikosteroid. Sedutan steroid mampu mengawal salur udara yang mengalami keradangan yang menjadi punca kepada asma. Keberkesanan sedutan steroid disesuaikan dengan betapa serius dan tahap kawalan pesakit. Bagaimanapun, kaedah terbaik untuk mengawal asma adalah dengan terapi imun. Asthma is an inflammatory disease of the airways in the lungs which leads to airway hyper-reactivity. Upon exposure to airway irritants, allergen triggers or infection; the airways contrict leading to symptoms of shortness of breath, chest tightness and wheezing. It is important if you suspect asthma to see a qualified Allergy & Immunology specialist for proper diagnosis and well as to identify your allergic triggers. A qualified Allergy & Immunology specialist can offer immunotherapy to selected patients who can benefit from this disease modulating treatment. If you have asthma, having an action plan developed between you and your doctor will help your asthma control.